Randi Alexander writes smokin’ hot romance with heroes who’ll have you begging to ride off into the sunset with them. When she’s not dreaming of, or writing about, rugged cowboys, Randi is biking trails along remote rivers, snorkeling the Gulf of Mexico, or practicing her drumming in hopes of someday forming a tropical rock-band. Forever an adventurous spirit with a romantic imagination, Randi is also family oriented and married to the best guy in the world, her own cowboy, Kick. Give in to the allure of passion, strong but vulnerable heroines, and irresistibly seductive heroes as Randi’s emotional love stories sweep you off your feet and leave you breathless. Randi loves to connect with her readers! 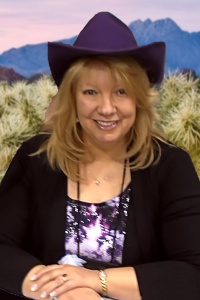 Say “Howdy” at one of her social network sites, send her an e-mail, or sign up for her newsletter. I'll be attending this fun event. If you're attending, I'd love to meet you and sit and chat over a cup of coffee or a glass of wine. Historical Deadwood - Where Books are Legendary! A multi-genre book fair featuring author-sponsored events like a PBR Rodeo, Breakfast With the Authors, a Full-Day of Sightseeing, and much more.